The chief function of a tendon is to enable movement of bones. The tendon transmits the force produced by the muscle to the joint. While the tendon can impart forces on the cells, it is also possible for the cells to exert forces on the environment around them. Researchers have shown that placing sizeable repetitive loads on the tendon doesn't just cause movement but also influences a number of cell responses. 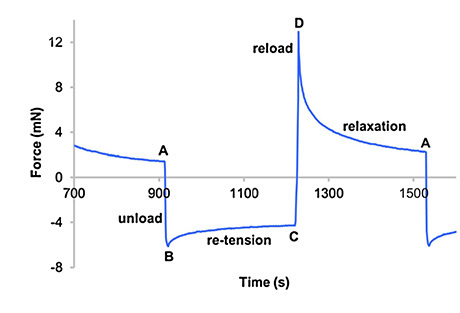 Tension appears critical for the the cells to behave in this way. Scientists from the Institute of Sports Medicine in Copenhagen and the University of Manchester have been trying to directly measure, for the first time, this phenomenom . Lead researcher Antonis Giannopoulos and his collaborators made tendon constructs from human cells obtained from donors. It took around 2 weeks after seeding the constructs for them to be fully formed. They designed a system to measure forces in these constructs. The data acquisition system comprised force transducers from Aurora Scientific, stepper motors with a motor controller, culture wells, and a Microlink 751 data collection system. The constructs were attached by their silk suture loops to the motor and force transducer via stainless steel hooks. The stepper motors applied strain via a threaded rod with a step resolution of 2.25 um. Deformation was applied at a rate of 56 um/s. Windmill software sampled force data collected by the Microlink at 1 Hz. The researchers used these mechanical tests to measure tension under different treatments. They successfully demonstrated the presence of cell-generated tension within the human tendon constructs. Their new system applied, detected and quantified the generated forces in real time, providing new insight into the field of tendon biomechanics. 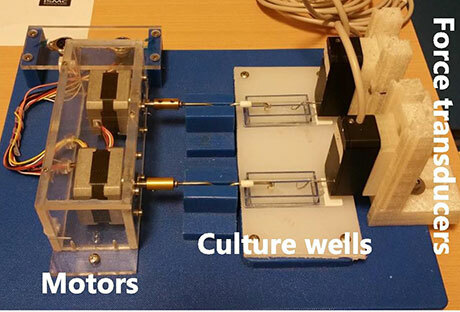 They concluded that the force monitor system is a useful tool to investigate tissue development and regeneration. The Microlink 751 data acquisition system is now just £295 including Windmill software. It lets: you measure temperature, strain, pressure, voltage, force and current through 16 analogue input channels; switch up to 32 digital outputs; monitor up to 32 digital inputs and count events with up to 8 counters. Read more about the Microlink 751 data acquisition system. Giannopoulos A et al, 2018. Cellular homeostatic tension and force transmission measured in human engineered tendon. Journal of Biomechanics, 20(1).